I started this blog to share my views with other individuals that share the same interest. Never would I ever have thought it would have ever gotten this far. Specially to the point where I can share opportunities where you the readers can sample a try products that I rave about! Check out what these Spiced Beauty readers had to say about Hawaiian Tropic Silk Hydration™ Sunscreen and After Sun Moisturizer. The scent is incredible! I found that the lotion spread easily and absorbed quickly. It did not leave a sticky or oily residue but rather left my skin moisturized and smelling fantastic. This protected me from the sun very well and I was eager to reapply throughout the day as it was such a pleasant experience. This is my new favorite sunscreen! Like the sunscreen, this smells great! I missed an area with my sunscreen and this creamy gel/lotion took the sting out of my sunburn. It was very soothing without being sticky or shiny like plain aloe vera gel. I will definitely buy both of these products as essentials for the summer! I absolutely loved the Hawaiian Tropic Silk Hydration sunscreen lotion. It goes on nice and smooth and isn't greasy. I wore it on a super hot and sunny day and it kept me shielded from the sun and sunburn-free. The Silk Hydration After Sun Moisturizer smells AMAZING and is soothing for the skin even if you don't have a sunburn! My skin still felt super hydrated even a day after applying it. Thanks Hawaiian Tropic! My review: The Hawaiian Tropic Silk Hydration Sunscreen is divine! It smells amazing and goes on so smoothly! I was on the beach in 23 degree weather and no sunburn to speak of! Fabulous! The After Sun Moisturizer is another amazing product! After my beach day, and a shower, I applied the product. It smells just as great as the Sunscreen and left my skin so soft and moisturized! I highly recommend both of these products, and at such a great price point, Hawaiian Tropics products are a great purchase for Summer! I had high hopes ever since I got these products. I can truly say they work wonderfully! I love the scents. They smell much better than any then any other sunscreen... Just smells like a lotion! It's also very moisturizing. The after sun balm/moisturizer is great too so you don't dry out after being in the sun. I love this product! I have tried both products a few times and I love them! I used to hate putting on sunscreen as well as moisturizer because of my very dry skin but now I don't have to worry about getting sunburns anymore. The after sun lotion is refreshing after a day out in the sun and quite moisturizing. I have dry/sensitive/acne-prone skin and I had no issues with either product. This product smells amazing compared to those regular sunscreen products! Not only does it does it do a great job of keeping me tan-free, it also feels great on my skin. Sunscreen tend to make my skin feel even drier than my already dry skin, but this product hydrates my skin, leaving it soft and smooth! I have used both products. I first used the Hawaiian Tropics Silk Hydration Sunscreen Lotion. Being very fair, I tend to burn easily. I used this just before going into my pool and found it great. I love that its waterproof and the scent is very pleasant. It worked like a charm for me! I used the Hawaiian Tropic Silk Hydration After Sun Moisturizer after I rinsed off from my swim. This lotion left my skin very soft and I really liked the coconut papaya scent. Very yummy! I will definitely buy these products and use them this summer! to review. I thought the samples were a great size, perfect to throw in my purse or beach bag. easy to apply ,absorb quickly, and didn't leave my skin sticky or oily. I would use it as a moisturizer all the time, because of the scent.. It went on very easy and had a nice cooling effect.. I tried both products at the beach and I like them. Out of the two, I prefer the after sun lotion because the scent is less noticeable. The sunscreen doesn't have the awful 'sunscreen' scent which is nice. I was lucky enough to have the chance to try out two new products by Hawaiian Tropic. I have to say that I love both the Silk Hydration sunscreen lotion and After Sun Moisturizer! I am very fair skinned with freckles and tend to burn very easily so I need to use sunscreen when I spend any length of time outside. We went to the zoo last week and before leaving I applied the sunscreen and found the scent to be heavenly. It is not overwhelming at all but just a subtle scent that is not overpowering and does not have that smell that many other products have. It is not greasy or oily and after putting it on I could not even tell I was wearing anything at all. It protected my fair skin and no burning! Once I got home I used the After Sun Moisturizer and it as well did not leave a greasy or oily residue on my skin. The coconut papaya scent smells yummy and left my skin feeling smooth and silky. Both products are a definite use again in my books and I will be grabbing the full sized products next time I go out shopping. Thanks for the chance to review these products. The Hawaiian Tropic Silk Hydration Sunscreen smells and feels amazing. It doesn't leave a sticky residue like other sunscreens, it absorbs quickly and it leaves my skin feeling soft. The smell is summer in a bottle! I love the hint of coconut. After being out in the sun the After Sun Moisturizer provides a nice cooling affect and is very hydrating. My skin feels soft for hours after applying and it also smells great. I love the combination of aloe and shea butter and can really see a difference after applying. I've really enjoyed using both products. I used to see applying sunscreen as a chore because I didn't like how they felt on my skin or the scents, but the Hawaiian Tropic products make me excited to use them! I will be purchasing both products because they're very effective and budget friendly. Yeah I did try it and I love it! It doesn't feel greasy on my skin and I have very sensitive skin. It hasn't irritated it. I am glad I got a sample, this is truly a great sunblock. Thanks for the opportunity. The Hawaiian Tropic Silk Hydration Sunscreen Lotion absorbs into my skin quickly and leaves it feeling soft and moisturized. It didn't leave any greasy feeling at all. It protected my skin well, leaving no signs of sunburn after running errands all afternoon in the sun. My favorite part was the scent, a perfect blend that makes me think of a tropical island. The Hawaiian Tropic Silk Hydration After Sun Moisturizer looks really cool with the ribbons of aloe and lotion. It goes on thick but quickly blends into the skin, leaving it smooth and supple. The light, fruity scent lasts a long time and really lifts my spirits. These two products together leave me with soft, healthy skin that smells amazing! I will definitely continue to use them both. Thanks for the opportunity to try these out! Love Hawaiian Tropic's Silk Hydration sunscreen lotion! Feels like lotion, not a greasy/sticky sunscreen like the ones I'm used to. Light coconut scent. Dries quick and non-tacky. Broad spectrum (UVA&B protection) and water-resistant. What is there not to like? I would definitely purchase this. Really like Hawaiian Tropic's Silk Hydration After Sun moisturizer. I wanted to sniff my skin all day; it smells so good! I tan really easily so don't suffer from redness or burns, but on my skin it was refreshing and so I can imagine it being very soothing for sunburns. The Hawaiian Tropic Silk Hydration sunscreen easily replaced my everyday moisturiser because it almost felt like my regular moisturiser and not nearly as sticky or greasy as sunscreens I have used in the past. The scent of the sunscreen was light yet delicious. Similarly, the After Sun Moisturiser smelled great and was also very hydrating after a long day of sitting in the sun! Overall, both products left my skin feeling great. Hawaiian Tropic Silk Hydration Sunscreen Lotion is a great product for someone who is looking for a lightweight, non-greasy sunscreen. Absorbs super quick & leaves almost no residue, except for the extra hydration from the lotion. It also smells pretty amazing for a sunscreen, and when I apply it - I feel like I am just applying a basic moisturizer. The After Sun Moisturizer smells great and has an interesting aloe and moisturizer swirled consistency that I really liked. Would def recommend. "Hawaiian Tropic as been one of my go to products for skincare in the sun for many years. 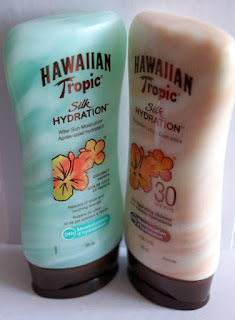 Recently I was given the opportunity to try the new Hawaiian Tropic Silk Hydration Sunscreen. I was very pleased it had a delicious smell, kept my skin moisturized and protected against the sun. I would definitely buy this product again. This was my first experience using an after sun moisturizer and I was once again impressed. The smell was super yummy and my skin feels hydrated after being in the sun all day. These Hawaiian tropic products live up to their name as they leave your skin glowing, silky and most importantly protected." It's been hot & ridiculously muggy out here over the past few days, so I wanted to make sure that I had sunscreen on or else I'd burn (again..) It applied evenly and didn't have an overpowering smell like many sunscreens have (thank goodness no coconut smell!) It also absorbed into my skin quickly and didn't feel oily. From biking and the heat, needless to say I was slightly sweaty and thankfully it did not appear milky. By the end of it, I was burn-free and slightly moisturized. It absorbs quickly and provides a cooling relief after a day in the sun. We were building a deck so I used it after every day and the best is the smell! Coconut smoothie! On a random note, I really like the packaging. I assumed the ribbons were printed on the bottle but that's actually the product! Very neat. Winner of the $50 giftcard is Jasmine G.